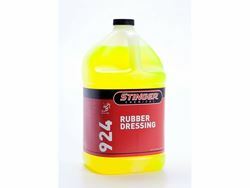 Stinger's Rubber Dressing is a viscous water based dressing that is economical and can be diluted up to 2:1. Leaves a glossy shine and is especially formulated for body shops. Safe for all painted surfaces, chrome, alloys and will not yellow white walls. Available in gallons, 5 & 55 gallon containers. Body Shop Safe!